The Therapod Adjustable Backrest is portable and lightweight enough to be utilised anywhere. The Therapod Adjustable Backrest features a patented inner elastic strap system and shell that when adjusted from the rear either increases or decreases the support for the back to suit your needs. The Therapod Adjustable Backrest is portable and lightweight enough to be utilised anywhere. Its versatility extends from drivingto work, at the office, relaxing in a lounge chair ... or in any seat that does not provide enough comfort or support. Therapod\'s unique design makes it suitable for all types of automobile seats. It fits both bucket and bench seats, and customising the seat for your individual comfort. The elastic straps provide excellent comfort and effectively relieve the jolts and jarring motions of travelling. Simply zip open the back of the Therapod Support, adjust the straps until you get the perfect support. It really is like having your own tailor made chair wherever you are. 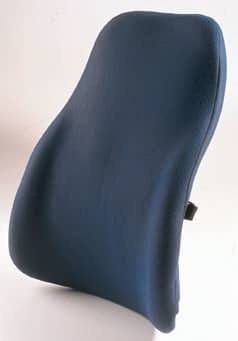 The Therapod Backrest comes in a standard size or for a taller person the Tall size is available.